McAfee virtualization solutions are designed to make virtual desktop security simpler and more scalable for large enterprise deployments. The McAfee Management for Optimized Virtual Environments (MOVE) platform provides security management tailored specifically to virtualized environments. Rather than running an endpoint security agent in each virtual machine (VM), MOVE AntiVirus delivers a virtual appliance to consolidate scanning processes and signature updates outside of the VMs, efficiently protecting all virtualized desktops. 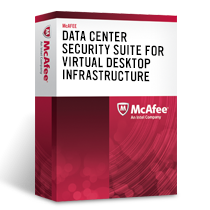 McAfee Data Center Security Suite for Virtual Desktop Infrastructure is a bundle that includes McAfee MOVE AV along with McAfee Application Control, McAfee ePolicy Orchestrator, McAfee VirusScan Enterprise, and McAfee VirusScan Enterprise for Linux. The consolidated platform allows organizations to get the most out of their virtualized desktops by optimizing the protection to ensure maximum performance. In tests, a virtualized protection allows servers to run up to three times the number of virtual machines, compared to traditional endpoint security protections. A hypervisor-native detection can identify any compromised virtual machine and isolate the vulnerability before it compromises other systems. Today most enterprises are in the midst of a major shift as the boundaries between physical, virtual, and public/private clouds are starting to blur. As organizations transform and optimize their data centers, they face the reality that data centers require ever-evolving solutions to keep their data safe. Traditional protection schemes come at a high price, leading many companies to sacrifice security in favor of performance. McAfee has developed a set of solutions for server, storage, and network security to rise to this challenge. McAfee® Security Suites for servers and data centers, which are integrated through McAfee security management, provide a flexible security infrastructure with complete visibility into today’s complex data centers. These suites help you discover all virtual machines, secure them, and grow your business into the cloud. The type of server environment, whether physical or virtual, on premises, or in the cloud, no longer matters when it comes to security. The use of McAfee Management for Optimized Virtual Environments (McAfee MOVE) AntiVirus means you get rock-solid security. Suites expand the security umbrella to cover physical and virtualized environments, bringing the power of the cloud within reach. Customers who want robust server security no longer have to sacrifice performance. A unique combination of technologies now preserves CPU availability while assuring a robust security framework. To satisfy the needs of the data center, the McAfee Server Security Suites are licensed on a per-operating system (OS) basis. McAfee Data Center for Virtual Desktop Suite is licensed per node, and the data center security suite is licensed based on each instance of the database. Servers play a crucial role in the operation of any enterprise. Most data centers have multiple servers performing key operations for their company: computation, email, hosting databases, serving as storage devices, providing Microsoft SharePoint access, fetching web content, and much more. Clearly, these servers need to have the capacity to perform their core tasks in business operations, but they also need to be secure. Breakthroughs in security technology provide maximum protection without tying up server CPU resources. McAfee Server Security Suites provide administrators with a complete view of all virtual and physical machines, whether on premises or in the cloud, all on a single-console management system. McAfee Server Security Suite Essentials uses a unique combination of blacklisting and virtualization technology to optimize server protection. Now customers receive the scalability and flexibility offered by the data center with the added benefit of robust protection and undiluted system resources. The McAfee Server Security Suite Advanced adds whitelisting and change control for even more complete server protection. These new suites from McAfee give customers security peace of mind, whether their servers are operating in a physical or virtualized environment, on premises, or in the cloud. The core of this flexible security coverage can be found in McAfee MOVE AntiVirus, providing a single security solution for changing data center environments. It’s a broadly accepted principle that the database is home to some of the most sensitive and valuable information within the enterprise, placing a premium on robust security. So it should come as no surprise that one of the four suites offered s the McAfee Data Center Security Suite for Database. This suite includes McAfee Database Activity Monitoring and McAfee Vulnerability Manager for Databases which monitor realtime activity and find potential weak spots in a database that might be exploited by hackers. The server and desktop security suites offer support for Microsoft Windows and Linux. The database security suite includes support for Microsoft Windows, Linux, Sun Solaris, IBM AIX, and HP-UX. The capability provided by the McAfee Security Suites for servers and data centers will finally remove any remaining roadblocks to broader implementation of virtualization and cloud environments. The benefits of this approach to distributed computing are readily apparent in terms of flexibility and cost savings. What’s more, concerns about the negative impact of traditional server security solutions on CPU availability and performance have created a situation where a large number of servers in the data center are either unprotected or under-protected. The enormous potential of virtualization and cloud computing can be realized today without sacrificing security for performance. Security technology tailored for the data center means that you don’t have to wait another minute to take advantage of all the benefits. Download the McAfee Server Security for Data Centers Datasheet (PDF). For more than 1,000 virtual machines, please use our Quote Request Form!